﻿s﻿pices and herbs are the backbone of Indian cooking. Knowledge of how to use spices and herbs is essential. As you start preparing Indian dishes you will begin to develop the sense of how and how much spices to use. Indian cooking is highly personalized, reflecting individual taste. These personal touches are what make all the difference, that’s why a dish never tastes the same at two Indian homes. The spices and herbs not only used to cook food but they have healing properties. Ayurveda use these roots, spices and herbs in the treatment of common physical ailments for thousands of years. In Indian cooking spices are always cooked before they go into a dish, they are generally added to the hot oil at the beginning of preparation and fried for a moment then other ingredients are added. Here is a short description of spices which are commonly used in Indian cooking. Asafetida has an extremely pungent, unpleasant smell, when it is raw, but its odor become much milder upon heating in oil. It is typically used to enhance the flavor of lentils (dals) and numerous vegetable dishes. 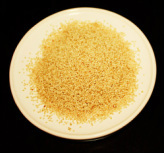 Asafetida comes in different form like in small pieces or powder. Pure asafetida is very pungent that is the reason only a pinch is used in cooking. Some store bought powder is mixed with wheat flour to reduce the odor of the spice. Some people like the flavor of the asafetida and tend to use a lot specially in dal (lentils) tadka as a flavor enhancer, some people do not like the taste of asafetida they may remove this spices from the dish . Since it has a very strong smell adjusts the amount used in cooking according to your taste. In Hindi these leaves are called tej patta. They are light green in color. These dried bay leaves are added to the, vegetable dishes, beans, meat dishes, rice pilaf and biryani for their aroma. Sometimes they are lightly browned in oil first to intensify the aroma. Black pepper is available whole, crushed or ground into powder. Black pepper has been used in India for flavoring the dishes and as a medicine for long time. I have used the black pepper powder to in hence the flavor of the curry. If you prefer you can add whole black pepper in the curry and rice dishes, especially in the rice pullav and cholas, but most of us specially children do not want to bite the pepper while eating. Black cardamoms are used in India for flavoring the food. Black cardamoms has a distinctly more astringent aroma, they are often referred to as big cardamom (Bari elaichi or moti elaichi) due to its size. They are about one inch pod, has a thick, husky dark brown skin. Black cardamoms are added to the mead dishes, vegetable curries and rice pilaf as a whole pod with the skin. It is one of the main ingredients of the spice mix known as gram masala. 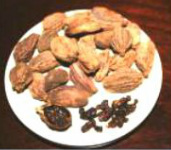 Black cardamoms are usually available only in Indian stores. Carom seeds are tiny seeds, and have a sharp and pungent taste. Even a small amount of raw ajwain will completely dominate the flavor of a dish. Carom seeds are usually fried in hot oil like cumin seeds, in small quantities, before adding to the other ingredients. They are used as a flavoring in vegetable preparations and snacks. 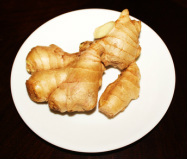 It is also traditionally known as a digestive aid, relieves abdominal discomfort due to indigestion and antiseptic. They are long, dark brown and dried sticks with a flavour . In Indian cooking cinnamon is used for flavoring as a whole or in ground form. It is one of the essential ingredients of gram masala. It is used as a whole in making rice dishes. Cloves are dark brown in color. They can be used in cooking either whole or in a ground form. They are used sparingly because they have pungent taste and fragrant aroma. Cloves have been historically used in Indian cuisine. In north Indian cuisine, it is used in rice dishes and almost all rich or spicy dishes as an ingredient of gram masala mix. It is also eaten as a mouth freshener. Cloves have antibacterial and antiseptic properties. Being a natural anesthetic it is used as a remedy for tooth ache. Coriander is the seed of the cilantro herb. The seeds are like tiny little balls. Coriander seeds are are used as whole, coarsely crushed or as ground powder. The seeds and powder are light yellowish green in color with a mild fragrance. Coriander is an important spice in cooking throughout India. It is add to almost every vegetable or meat curry and often is the major part of many spice mixtures. Cumin seeds are oval in shape and brownish –yellow color. They are called jeera in Hindi language it is one of the essential spice to have in a North Indian kitchen. It is widely used for tadka or tempering the Dal’s and vegetable dishes. Cumin seeds are often fried in the oil in the first stage of preparing a dish because sautéing and roasting brings out the flavor and aroma of the jeera. It used as a whole, ground or roasted form depend on the recipe. Roasted jeera powder is used to garnish raita (yogurt preparations) and chaat (savory snacks). Cumin seed are also an essential ingredient in making garam masala. Fennel seeds are highly aromatic and flavorful herb with culinary and medicinal uses. The seed is the oval green or yellowish brown in color. 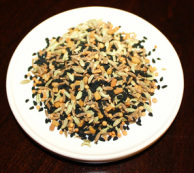 The greenish yellow fennel seed are thicker and resembles cumin seed and used for cooking. The green fennel seeds are small and thinner and has more delicate flavor. It is the variety of fennel which is traditionally served after dinner combined with cardamom. It is also known as lakhnawi saunf. Fennel seeds are used as a powder or as a whole in cooking. The seeds and the leaves of the plant are used in Indian cooking. They both have different flavors and aromas. The fenugreek seeds are rectangular and brownish yellow in color and have a bitter flavor. They are used in cooking and in pickling. Fenugreek leaves are known as methi leaves they are cooked fresh and in dried form. The dry leaves are aromatic and slightly bitter to the taste. Garam masala is a mixture of spices and it is essential ingredient in most northern Indian cooking. The word garam (hot) refers to spice intensity, not heat. Garam masala is pungent, but not hot. The spice combination varies region to region. This is the most widely known spice mixture in Indian cooking. Garam masala usually either added to dish toward the end of cooking or sprinkled over just before serving to retain its aroma. It is a combination of cinnamon, cloves, black pepper, black cardamoms, cumin seeds, bay leaves. Some people like to add star spice, coriander seeds and nutmeg as well. You could buy ready-made or make it at home. Green cardamoms are little green pods. They have a strong, unique taste, with an intensely aromatic fragrance. They are widely available in all Indian grocery stores as green pods, seeded or in powdered form. They are usually used either in powder form or as whole for flavoring the desserts. 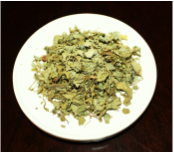 They are also used in meat or poultry preparations and as a traditional flavoring in tea. They are eaten as a mouth freshener after dinner or lunch. Mango powder is made from raw green mangoes. Mangos are plucked before they ripe, then they are peeled, cut and sun- dried, then grounded into powder. This powder is known as amchoor powder, it has a sour taste. It is primary use in vegetarian cooking and chutneys. It gives a sour and tangy taste to dishes. Mustard seeds are known as rai and the mustard leaves are known as sarsoon, they are both used in cooking as a spice and as vegetable. Indian mustard seeds are purplish brown in color. In Northern India mustard seed is used primarily for making pickles and in vegetable dishes.In southern India it is as important as cumin seeds in north. For cooking the seeds are usually roasted in oil until they pop. The oil extracted from mustard seeds are known as sarson ka tail, is used for cooking and massage all over North India. Onion seeds also known as Nigella or kalaunji. The Hindi term kalonji is widely used by Indians. They are often called onion seeds because they have slight onion like smell, actually has n nothing in common with the onion plant or any way related to onions. These black tear drop shaped seeds are used in pickling, vegetable dishes, and for sprinkling on top of the famous tandoor baked bread called Tandoori naan. 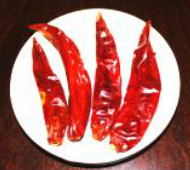 Red chilies are an important ingredient in Indian cooking. Indians love red chilies, not just for its hotness but it enhance the flavor of the other ingredients and of the dish. Numerous varieties of red chilies are used in India, each with its own distinct aroma, flavor, and pungency. The ripe red chilies are plucked, sun dried and used as a whole or grounded to the powder. Most of the Indian like their food quite hot. I have kept the amount of chili to minimum. You can adjust this amount according to the taste. Saffron, known as kesar is a spice derived from the flower of the saffron crocus. It is the most expensive spice in the world. It is available in thread or powdered from. Saffron threads are reddish brown in color and give beautiful orange yellow color to a dish. In Indian cooking saffron is primarily used in desserts, in mogul cooking it is used in meat and rice pullav, biriyani, and zarda (sweet rice.) The best way to use saffron is to powder it with fingertips or with the back of the spoon then soak it in a little hot water or milk for 10 minutes then add the solution to the dish you are preparing. This will ensure even coloring and maximum flavor. 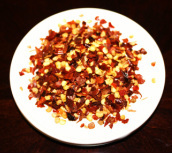 The five blends of spices give the unique flavor and taste to the dish. Unlike most spices mixes, Panch puran spice mix is always used as whole and not grounded. This masala mix is usually fried first in cooking oil, once the seeds start popping then other spices and vegetables are added. Panch puran is readily available, pre made in Indian grocery stores. The white poppy seeds are used whole or ground, as an ingredient in many foods and they are pressed to yield poppy seed oil. These seeds are off white, odorless, and flavorless in their raw form. In Indian cuisine, the white poppy seeds are part of the Indian spices. The seeds are usually ground up with other spices and added for thickness, texture, and also give added flavor to the meat and some vegetable dishes. These seeds are also used to make khas-Khas ki burfi on janmasti (lord Krishna birthday). In India salt is used to flavor the food. There are many varieties of salt are used in Northern India to flavor chat, chutneys, cold drinks and cooking meals for fasting (Varats) on holidays. The most extensively used salts are white salt commonly referred to as table salt, black salt (kala namak) rock salt (sendha namak). Black salt which has a very pungent smell is used for chat and sweet and savorytamarind chutney and sendha namak is used for varats (fasting) meals. Unrefined sea salts are also commonly used as ingredients in bathing additives and cosmetic products. Tamarind looks like a wide bean. As they ripen, their green skin turns into dark brown in color. Tamarind pods, when fully ripen, are plucked, peeled and pitted, and the pulp compressed into cakes. Tamarind is available in cake, juice and concerted pulp form. It is used more to savor the dishes in southern India then North. In north tamarind is used for chutney. Sweet and sour Imly chutney is widely used in preparing chaat. In Uttar Pradesh are tamarind is also eaten when the pads are green and not fully ripe. Turmeric is a root that has antibacterial properties, it is used as a powder it gives a musky flavor and yellow color to the dish. It is sacred spice in Hindu religion and is used in religious and social rituals and wedding ceremonies. Turmeric paste is applied to bride and groom before marriage, it is believed turmeric gives glow to skin and keeps some harmful bacteria away from the body. 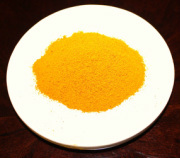 In ayurvedic practices, turmeric has many medical properties. It is used as an antiseptic for cuts, burns and bruises and wide variety of skin creams. North Indian loves this herb. Fresh coriander leaves are used to garnish, in marinades and in chutneys. Coriander leave chutney is one of the most popular chutney in North India. 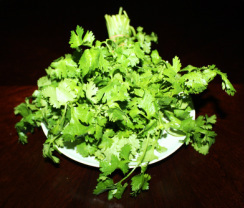 Both coriander leaves and tender stems are chopped and used as garnish. In addition to their decorative effect, the leaves lend a very distinct flavor to a dish. Currie leaves are bright green leaves and they have a pungent aroma. 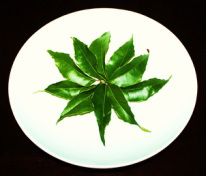 Curry leaves are essential to south Indian cooking. Most south Indian recipes call for leaves, in North India curry leaves are used to make Sāmbhar for idly and Dosa. Curry leaves are used in form of dry leaves or fresh leaves. Green chilies are the part of Indian cooking for long time. Indian cooking uses chilies in everything, in snacks, such as bhaji, chilies are dried, roasted, pickled and salted as a side dish. Chilies come in all shapes, sizes and intensities. Green chilies are often used in Indian cooking to in hence the flavor. If you like the flavor of the green chilies but do not like it hot then you can remove the seeds and membrane to reduce the heat and the amount of green chilies could be adjusted to the taste. Chilies can be stored for up to a week in the refrigerator. Garlic has been used as both food and medicine in many cultures for thousands of years. Raw cloves of garlic have a strong pungent aroma and a sharp taste that mellows and sweetens with cooking. Consumer garlic comes in many formats, including fresh, frozen, minced or as a paste in the jars and dry powdered. In Indian cooking only the fresh garlic clove is used. It is peeled, an either finely chopped or ground to a paste and often paired with onions. Garlic powder and garlic salt are quite different from the fresh garlic and cannot be substituted. In Hinduism garlic is considered to stimulate and warm the body and to increase one’s desires. Some devout Hindus generally avoid using garlic and onion in the preparation of foods for religious festivities and events. Some people avoid eating garlic and onion on a daily basis and even do not allow in their kitchen. Because of Garlic health benefits and medicinal properties the consumption of garlic has been increased. Onions are the very important part of North Indian cooking. 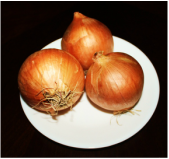 Onions are added to virtually every dish and are also pickle or eaten raw as a salad. The whole onion plant is edible and used as food in some form or the other. Onion come in many forms like fresh, canned, caramelized, pickled, powdered, chopped and dehydrated forms. In Indian cooking only the fresh onion is used and cannot be substituted. Fresh onion is the most important ingredients for making the masala for the vegetable or meat dishes. Green onion (hara piaz) which is known as green onion is the young sprout that appears before the onion bulb begins to mature. They are milder and different in taste and texture than mature onions. The green onion can be served in a number of different ways, chop them into small pieces for salads, or use them for garnishing the dishes or make yogurt salad or cook them with vegetables.